Nigeria government has come again with another gimmicks against Biafra restoration and justice awaiting Nnamdi Kanu in ECOWAS court next tomorrow. Unfortunately, our case in ECOWAS court is not about this useless and empty case. Why should Biafrans be jumping up and down for the Kangaroo bail ruling targeted at avoiding court hammer next tomorrow? What does it mean that Nnamdi Kanu will not be allowed to enjoy his liberty after the said useless release on with useless conditions? Will he now be in house arrest justice because he is accused? Judge Binta Nyako should tell those writing those script which she is acting that they are fools and can never be smarter than Nnamdi Kanu. Is that what Bar Emeka Ugwuonye who said that he is an erudite lawyer came to do? I am not a lawyer but I know the line by line. I am not afraid about what Nnamdi Kanu will do because he will certainly reject the useless conditions as a big hammer is about to fall on Nigeria in ECOWAS court on Thursday. Let nobody forget that they are only trying to escape the hammer of ECOWAS court next tomorrow should they release Mazi Nnamdi Kanu today. "I will not sacrifice the due process of law because of speedy court process over the principle of natural process on the altar of speedy release" - Mazi Nnamdi Kanu on December 29, 2015, in front of Hon Justice Ahmed Mohammed. ECOWAS court ruling is next tomorrow and they think they will by this Kangaroo bail ruling escape justice of ECOWAS court. 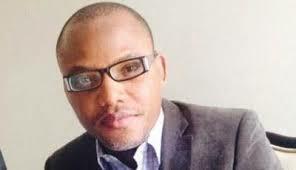 Why is Biafrans not reading signs of time. ECOWAS court justice for Nnamdi Kanu next tomorrow is sacrosanct. I can never be decieved by the judicial gimmicks of Hausa/Fulani half backed Justice Binta and Nigeria government.